Alcohol is too widely available and harming health in some parts of the Highlands, the area's health board has warned. NHS Highland looked at the provision of drink through licensing applications granted by Highland Council across the local authority's 22 wards. 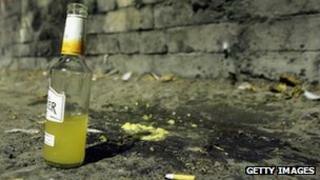 The health board said there was an "over provision" of alcohol in Caol and Mallaig, Cromarty Firth and on Skye. Fort William and Ardnamurchan also had a high availability of alcohol. Other wards listed by NHS Highland were Dingwall and Seaforth, Inverness Central, Inverness Millburn, Inverness Ness-side, Inverness West, Landward Caithness, Thurso and Wick. Dr Margaret Somerville, of NHS Highland, said the production of alcohol was important for creating jobs and generating money for the economy. However, she warned irresponsible drinking was putting people's health at risk. A third of men and a fifth of women in the Highlands were drinking above the recommended weekly limit, according to NHS Highland. Dr Somerville said: "Most of us would agree that something needs to be done to tackle the problem with alcohol in the Highlands and in Scotland as a whole." "NHS Highland is working with Highland Council licensing board to provide members with information on the health effects of alcohol." On results of the review of Highland's 22 wards, she said: "At present, there is no single methodology for calculating over provision, but NHS Highland believes that excessively high levels of alcohol-related harm to health indicate harmful and high levels of alcohol consumption in those areas. "Such high levels of consumption occur because alcohol is both widely available and affordable in these areas. "We therefore consider such areas to be over provided." Last week, irresponsible drinking was described as "the curse of the Highlands", by councillor Kenneth MacLeod during a presentation to Highland Council by Dr Somerville on the state of the region's health.